Earthsave is a non-profit organization located in Vancouver, BC, offering information on environmental sustainability, better health, and compassion toward animals. 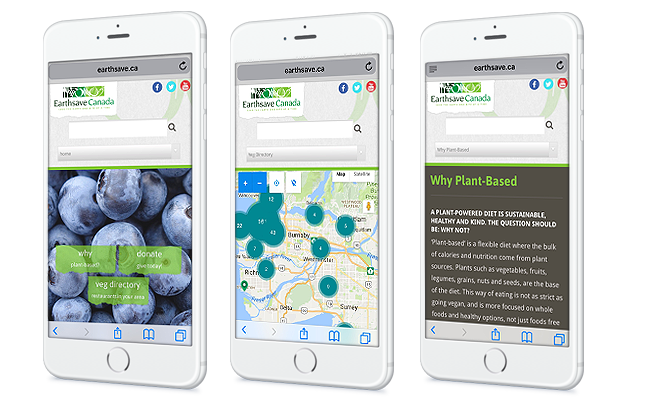 Accent45 worked with the Earthsave Board of Directors, creating an updated website that is mobile-friendly for Vancouver, BC locals looking for vegetarian options. Their previous design outgrew itself needing better organization, plus getting it up to speed with accessing on mobile devices. A custom design was created and the structure was based on their specifications and color scheme.